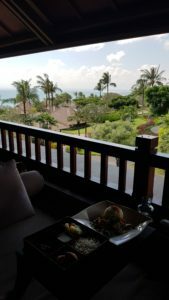 Review: Ayana Resort & Spa, Bali. It was 12:30am, I was watching a movie on my laptop, tucked snugly inside the duvet. My wandering eyes met a pair of dreadful eyes in the well lit up room, above the curtains, glaring mine. Those eyes didn’t mean any harm yet created havoc in my heart, as I panicked & reached for the phone and immediately called the reception to help. In less than 5 minutes, the housekeeping staff came. Two men in traditional Balinese dress smiled at me, while I swiped off the sweat beads on my forehead and smiled back sheepishly. They were not new to these kinds of panic calls late in the night. One of them went inside with a long broom, while the other sat under the wall to catch the miscreant. As the first guy nudged the little thing, it fell off the wall and bounced on the floor, just when the other guy caught it. It was deft handling, so say the least. While leaving the room they showed the monster to me. Those eyes said ‘I’ll see you again, you’re in the land of lizards after all’! This small help from the housekeeping staff at Ayana Resorts & Spa helped me sleep peacefully. Otherwise I would have spent the whole night looking from my duvet into the walls, ceiling, floor to anticipate the next steps of that lizard. This review is not about how brave or resourceful their staff is, but it did set the tone for my stay, as I came to expect only the finest in hospitality standards from them. 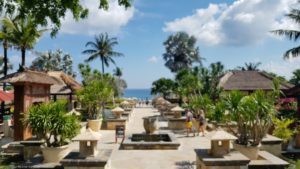 Ayana Resorts & Spa is not the place to stay if you have plans to walk around the city, go clubbing in other cities, or take a city tour. Because it is a city in itself! You need to stay here to explore its beauty and magnitude. 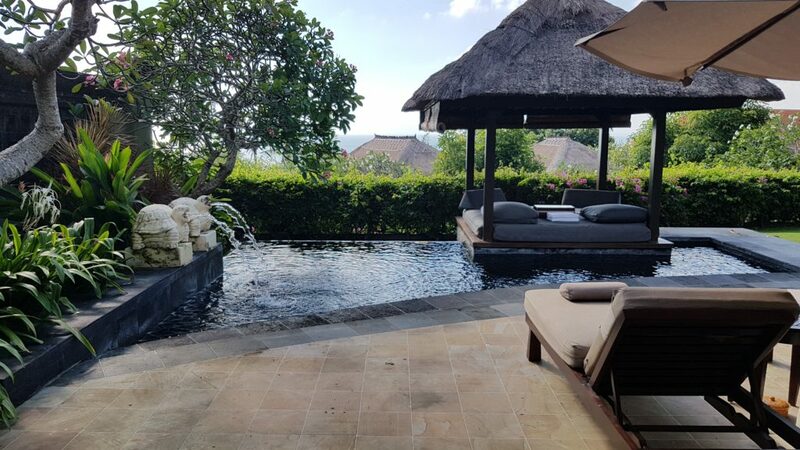 I have also met people who’ve travelled to Bali in a 10 hour flight from Dubai, just to stay at Ayana for 5 days and come back without leaving the hotel! 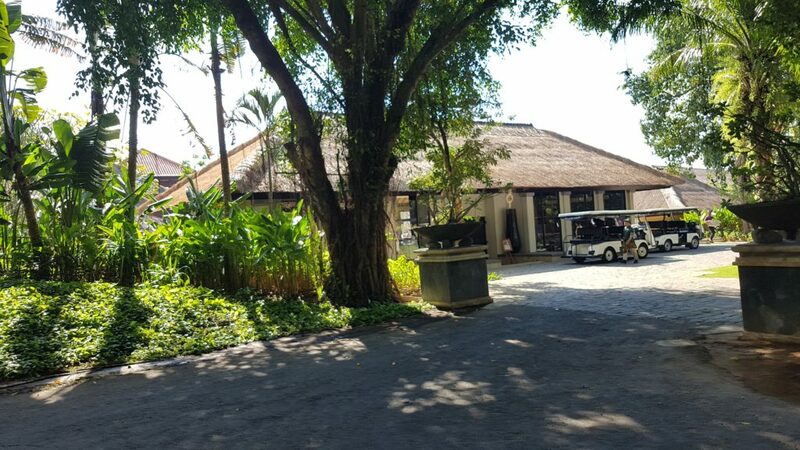 The resort is divided into 2 hotel properties (Ayana and Rimba) while villas have their own piece of land. 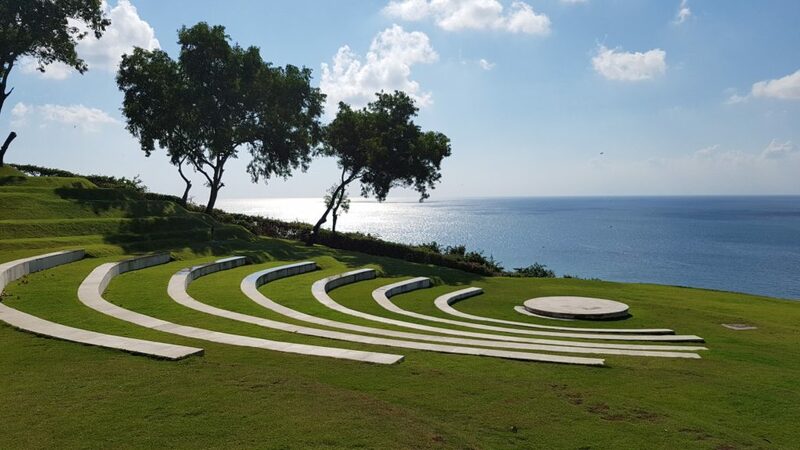 Further bifurcations mean there are several infinity swimming pools, restaurants & bars, play areas, chill out areas, random areas, private beaches, spas scattered around foresty areas to one on the edge of the cliff, open air auditoriums, wedding lawns, and endless swathes of land boasting of greenery without any other utility. It would be futile to walk across the property, that’s why they have shuttle service plying every 15mins or so. Since Ayana has its own cliff, they’ve utilized that part of the land in the most amazing manner. <Insert applause> Welcome Rock Bar. 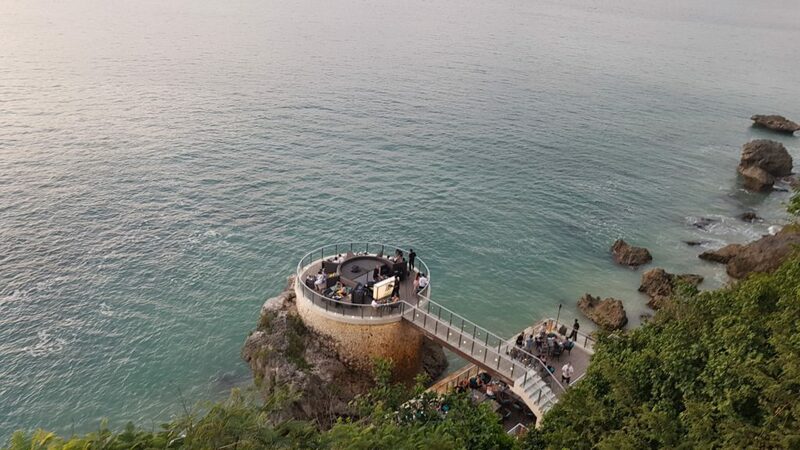 You need a cable car to reach Rock Bar. 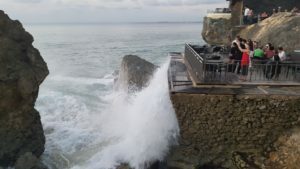 It’s a cluster of bars on the cliff, few on the same elevation, some above, some on the sea, while to reach one of them you have to cross a giant rock from inside (yes, they’ve made way by cutting and even making stairs inside as you go down and up to reach another part of Rock Bar). The sunsets here are legendary, and you need good few days or months of prior booking if you want to experience this place. And you thought money could buy everything? 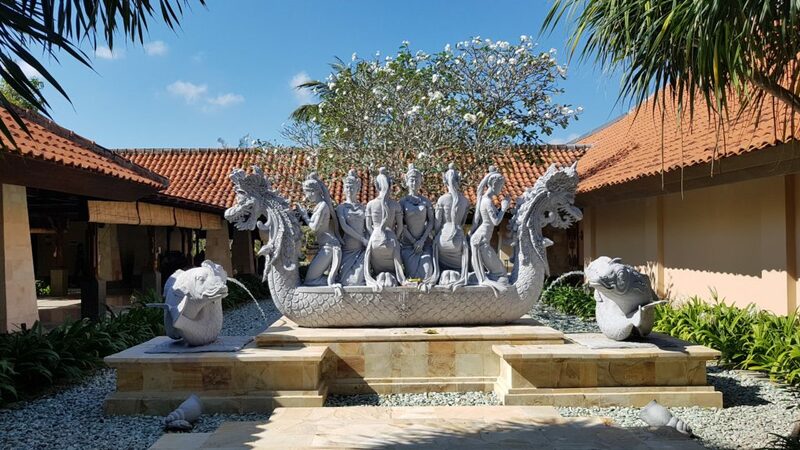 Apart from the rock bar, there are many other restaurants in the Ayana Resorts & Spa, each trying to outdo other in décor, location, architecture, service, and of course, food. 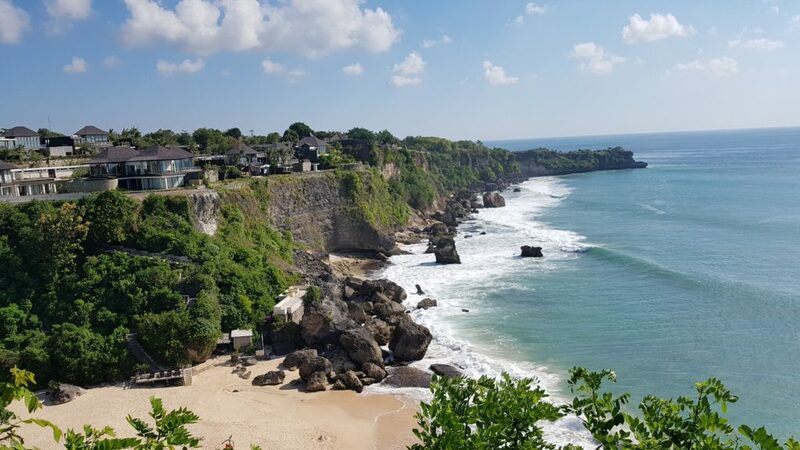 You really don’t need to go out in Jimbaran if you’re staying at Ayana, as you’re already spoilt for choice. The rooms at Ayana are quite large, roomy and classy. They have subtle charm and understated luxury. Apart from the bedroom, there is a small seating area that doubles up as a living room though in the same room. The balcony is big enough to party, while they have a raised platform with a small table to have your food should you desire to not walk up to their restaurants. 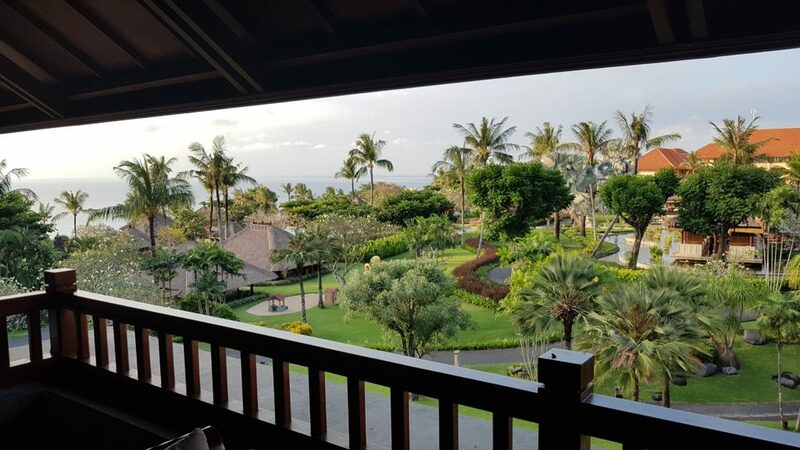 After all, patrons can tire walking across the resort and may order food from the in-room menu. 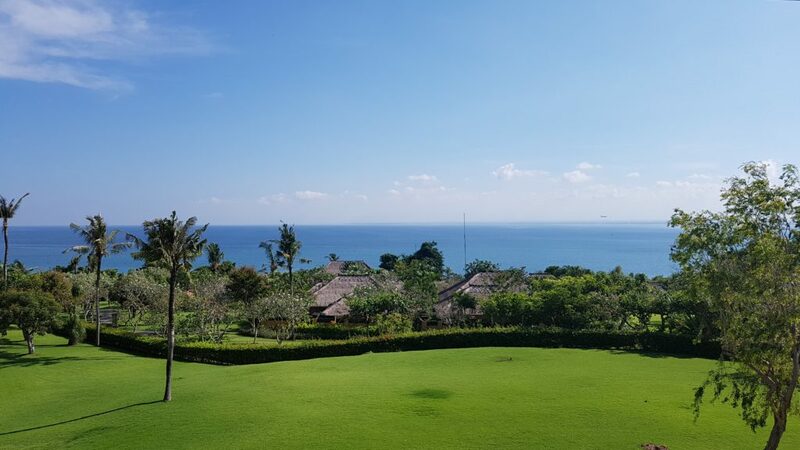 But the biggest plus of any of the rooms (whether you have partial sea view or full sea view) is that you get a splendid view of the clear blue sea. Those seeking peace would love this resort, while those looking for an activity filled day would also find themselves busy here. Those who seek an extra dose of luxury would also love this resort. Each villa is isolated, having given enough distance from the other for full privacy. The 2 rooms are large, while the patio is a magical land. Open air Jacuzzi, large lawn, sea view, barbeque area…you wouldn’t want to leave your villa. The wet area (washroom) has a large tub, with glass walls so that you enjoy uninterrupted views of your lawn and the sea. 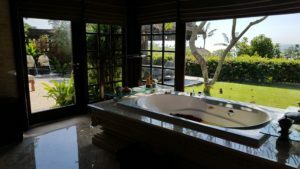 The incredible experience doesn’t end here, as the villa as large walk-in closets, all the luxuries you could think of, while a shower in the backyard in a stone pathway under the bougainvillea makes for a picture perfect noon bath. 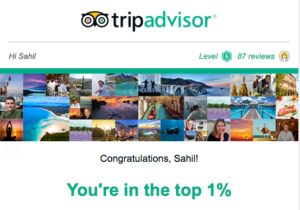 Whatever one would want from a resort, Ayana is surely going to make every kind of traveller into a gleeful patron.